The side table is probably my favorite part of my bedroom. I stacked a bunch of books on top since they didn't fit in the space underneath the drawer. They include Audrey Hepburn's biography, written by her son, that I scored for $3 years ago. It's such a beautiful book and I admire how she lived her life from start to finish. There's an issue of Vogue (thank you to the people who previously occupied our apartment and forgot to change their address) as well as free art school admission catalogs that contain my forgotten hopes and dreams. 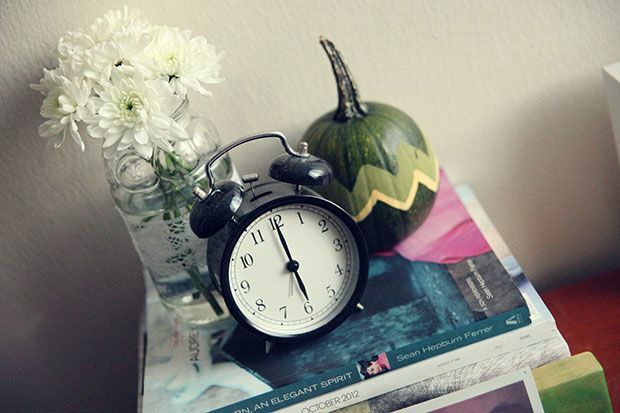 The alarm clock is from Ikea (and it's currently telling me that even clocks need dusting) and the little, green pumpkin is one of the bad boys I picked up this past weekend when I went pumpkin picking. I added some chevron stripes because you can never have too many chevron stripes. And my makeshift vase is just a cleaned out spaghetti sauce jar (life on my own means lots of spaghetti). I wrapped a piece of gorgeous lace around it and plopped in some beautiful, fresh flowers. Super easy decorating? I think so. The poster was an illustration I had printed out back in college and the little painting of a tree at dusk was given to me by Jeremy. He picked it up while he was at Bonnaroo. When it came to my bed, I wanted to make sure I woke up to the people and things that I loved. 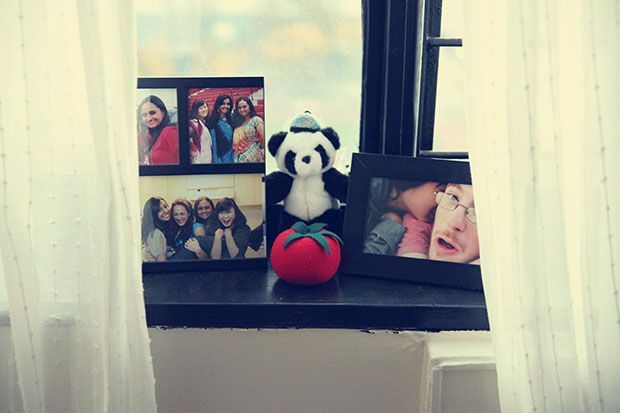 Right next to my window I have pictures of my favorite people in the world as well as the tomato that reminds me of my year as Governor of the NJ District of Circle K International. Above my bed I cut up pieces of felt to create bunting which hangs underneath a hat I thrifted for only $5 in Brooklyn. My sheer curtains are also from Ikea. 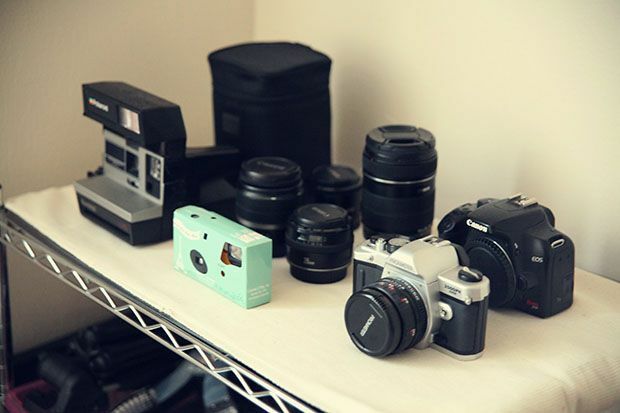 The other corner of my room contains all my miscellaneous things, including my beloved camera gear. It reminds me to get out and work on my photography more and practice with different lenses. My film camera has been using the same roll of film for the past two years because I haven't been using it as much as I would like. Hopefully I'll be able to finish up the roll within the next few days so I can rent out a photo lab and develop it myself. My one "splurge" was an antique-looking map that I bought online for $8. Man, what a splurge. ;) The yarn and mesh garland was another DIY that I whipped together for super cheap. 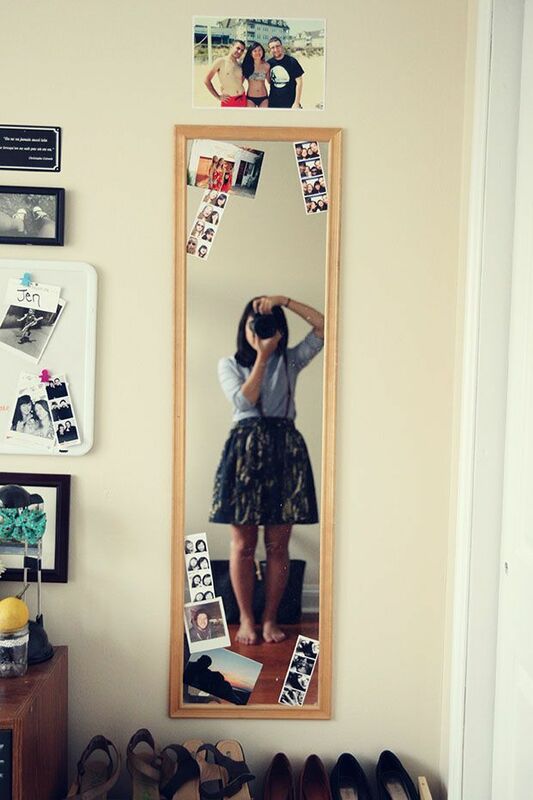 Finally, this mirror has been by my side since I was probably eight. It's done me well. I surrounded the frame with various pictures of moments and people I want to remember forever. 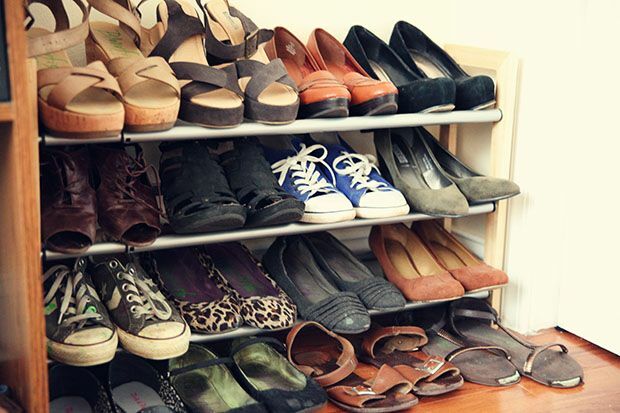 And of course, I had to stash my shoes somewhere. My mom likes to remind me that I still have the other half of my shoe collection sitting at home. 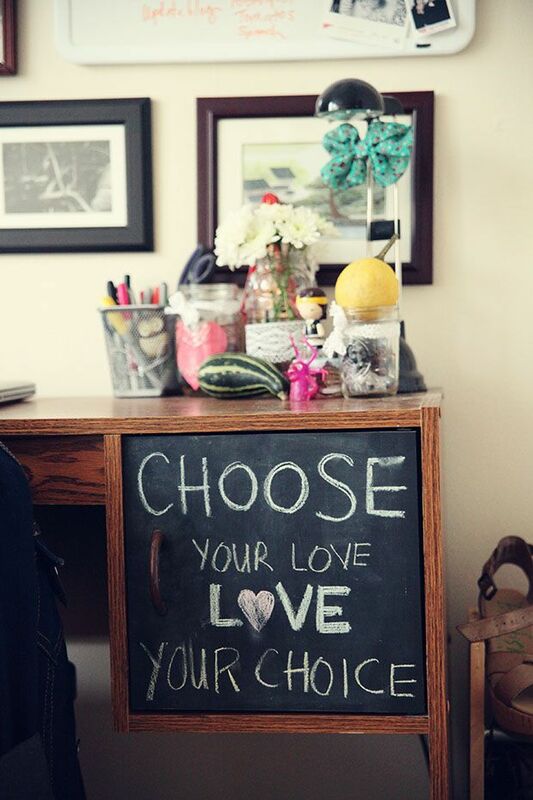 Love your room! Reminds me of my own room. (: I have a bunch of jars from various foods that I tend to keep around in random places..
Adoring your decor! 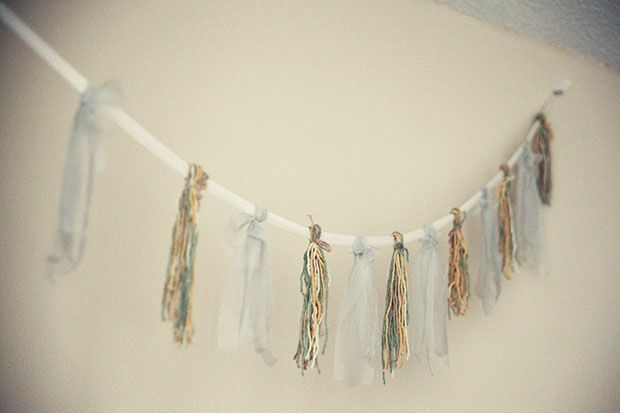 I really love the hanging streamers and bunting - so cute!! 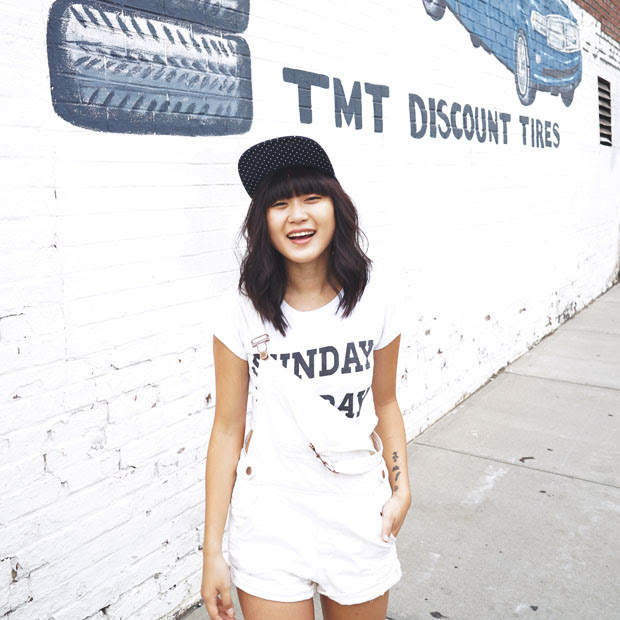 you are so creative and i love your style. i love the map and all the buntings....so cute! I love your room!! And that you seem to be a Blowfish shoes addict. I'm with you there. love your room! its so cute and inspiring!! 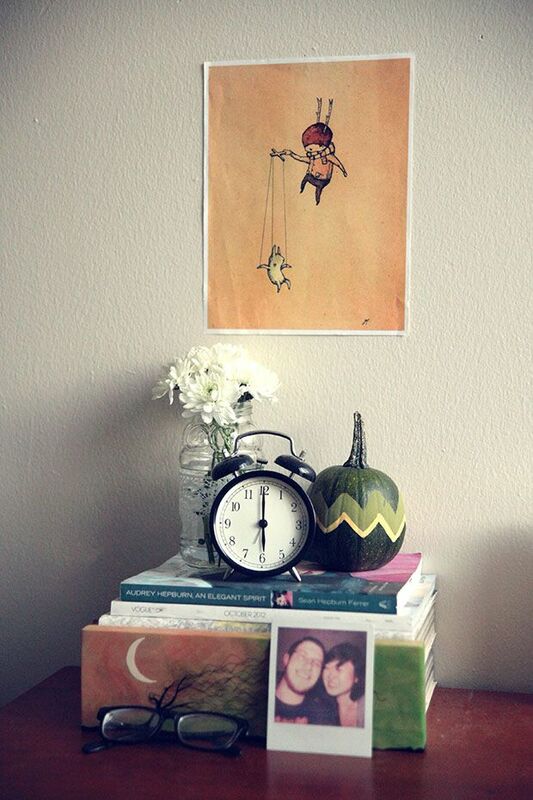 Thanks for this little peek into your home! Thanks so much for checking out my blog, so glad I found yours!! Love all of these simple ideas for room decor. Everything looks amazing, thanks for sharing! 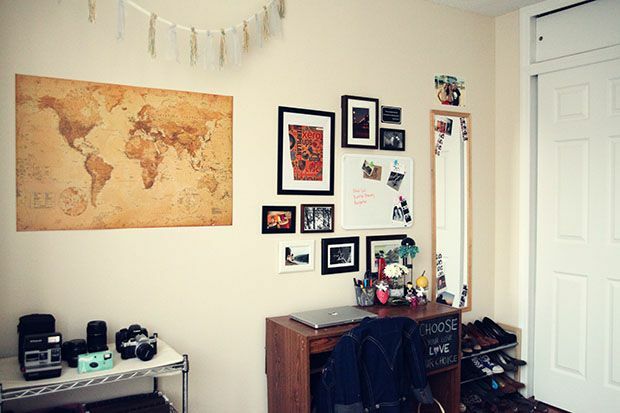 I love how you decorated your room! I've been looking a lot for inspiration to redecorate my room, and I was actually going to make bunting in my favorite sports team's colors for my room as well! 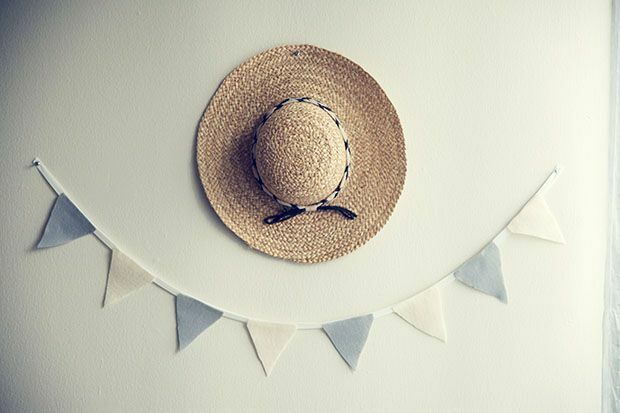 What a cute idea to place it under a hat as well! I love it! I love your prints, touch of chalkboard, and bunting. So fun!!! Cute! I love how everything is so personalized and 'lived in' without feeling cluttered or busy. Awww Jen! Our photobooth picture is somewhere visible too! I loved that day and want to remember it forever and ever<3 I absolutely adore your room Jen! When can I come over? 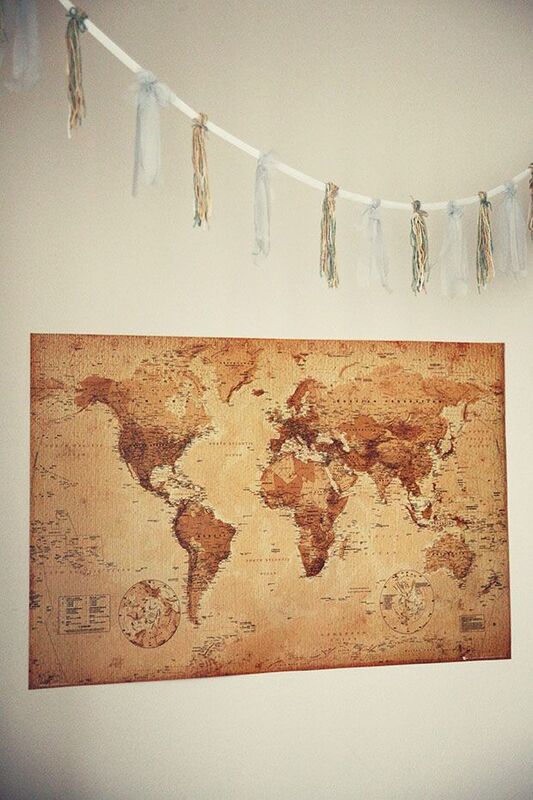 For reals :( I had wanted to get a world map to put over my bed but couldn't find one cheap enough (I mean $8??!?! Where did you even find that?!??!! ), so now it's cherry blossoms which I'm okay with that too :) I'll be posting pictures of my room soon too! I just took pics yesterday. And...I haven't used up all of my disposable camera either...lols. I don't think I've taken any pics since that weekend. Gotta get to it! 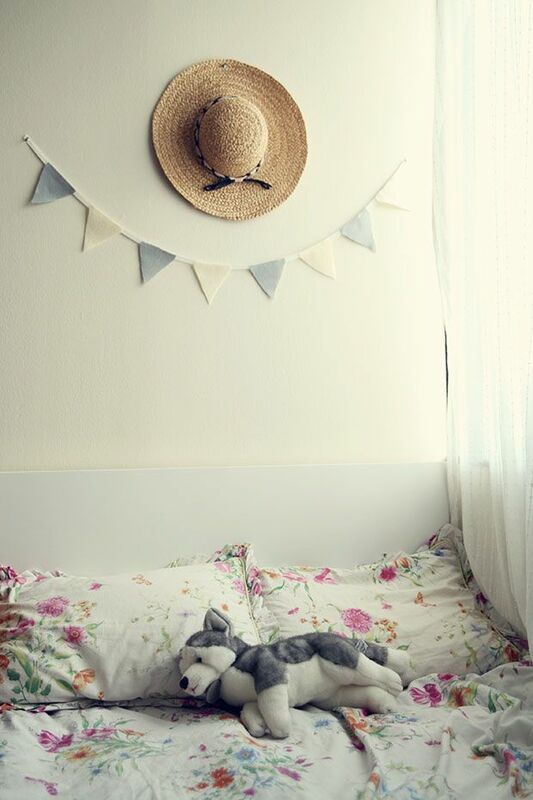 your bedroom is adorable! i love your desk. Great decor! 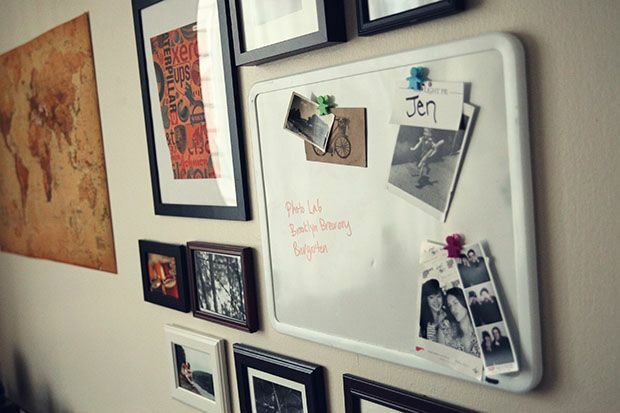 Love especially multiple photos on the wall in simple frames.... so tasteful! 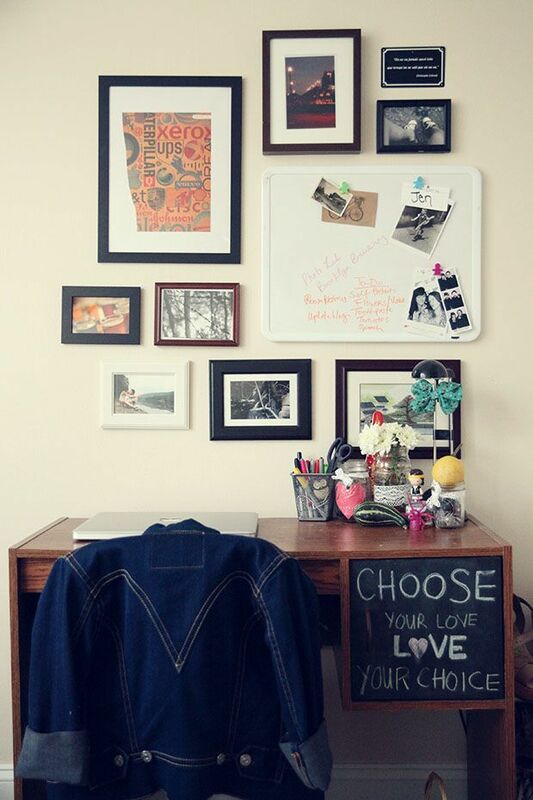 Love your room decor.Especially the desk beside your bed. :) You're so creative!! I love your army of cameras!